Our new travel trailers are some of the most popular RV’s that we sell at Bucars Rv Dealership in Calgary. Our new travel trailers are by far the most affordable, versatile and flexible option when it comes to RV’s making them very popular to all different types of RVers. We carry a large selection of new travel trailers in order to suit the needs and different applications our customers are looking to use them for. In addition to our large selection of new travel trailers, Bucars RV also offers some of the best value in Alberta. The RV specialists at Bucars are ready to help you find the perfect travel trailer for your family. Our new travel trailers come in a large variety of shapes and sizes to suit your needs and tow vehicle. From large models with all of the amenities you have at home to compact ultra lightweight models, our new travel trailers are versatile enough to suit any application you may have. 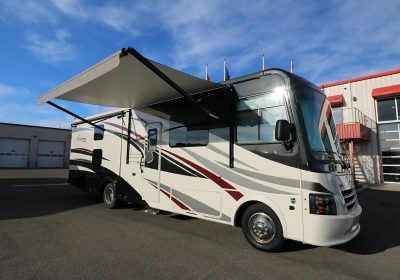 The variety of shapes and sizes enables us to get you into a new travel trailer without having to upgrade your family’s current vehicle to accomodate a new RV purchase. If you have a heavier rated tow vehicle, we also offer larger more luxurious options for those looking to take all of the comforts of home on the road with them. Our new travel trailers work with many different tow vehicles and applications, this is why we are proud to offer such a large range of shapes and sizes. At Bucars RV, we are passionate about getting out customers into the right RV to suit your needs. Our new travel trailers come in many different variations and styles. Depending on what you’re looking to do with your RV, we have the solution for you. Our RV’s offer innovative features like built in garages, rooftop patios, fireplaces, lowering roofs, fireplaces, offices and much more. Some of our larger models can even sleep up to 8 people. Whatever your unique needs are, Bucars has a new travel trailer that suits your needs. If you have been searching for a new travel trailer, it’s time you took a trip to Bucars RV dealership. We have some of the best RV experts in the province ready to help you find the perfect new travel trailer for you and your family. For more information on our new travel trailers, please contact us at 403-207-1666 or stop by our RV dealership just north of Calgary.